Behind the scene of the Alexandria Gazette story published 3 May 2018 on “Martha Miller’s Kindergarten School” (1930s – 1950). I was encouraged by Mrs. Martha Napper-Miller’s former students to share their fond memories of Mrs. Miller. When I started researching Mrs. Miller last year, only one person I talked to knew that Mrs. Miller was married. Mr. James E. Henson was one of Mrs. Miller’s students and she was also his babysitter. Mr. Henson shared with me that he stayed with Mrs. Miller during the week and his mother picked him up on the weekend. He remembers Mr. Miller being a quiet man. Mrs. Bernice Lee stated that her kindergarten teacher was Mrs. Alma Pinn-Murray who had her school around the same time as Mrs. Miller. Mrs. Murray was also a public school teacher. Dwaine E. Terrell remembered his kindergarten teacher, Mrs. Mary Howard-Penn. Also Deborah Ford-Nelson and Rosie Ford remembered going to Mrs. Mary Howard-Penn’s Kindergarten School. Rosie stated, “She taught me how to read and much more.” Rosie has been friends with Mrs. Penn’s daughter, Sandra, since they have been four-years-old. Also to note that Mrs. Mary Howard-Penn had several siblings who were teachers in the Alexandria Public School system in the 1950s through 1980s. Gail Arrington-Jones’ kindergarten teachers were Mrs. Ethel Nelson and Mrs. Mary Burgess. Gail stated, “We honored Mrs. Nelson in 2015 for her operation of the Kindergarten School in 2015.” It is noted that Mrs. Nelson still lives in Alexandria, Virginia. In the newspaper article, I stated that Mrs. Miller had two other teacher aides, Saretta Norton and Christine Butler. Christine was Mrs. Miller’s niece. Thank you Becky Mays for confirming that information. Becky also stated, “Ms. Christine Butler held her kindergarten classes in my Mom’s house on Princess Street. It was awesome.” After the death of Mrs.
Miller in 1952, Christine continued to teach. She moved the School from Oronoco Street to Princess Street. Over and over again, the African Americans of Alexandria historically proved that they did everything possible to improve their lives. Education was a priority for their children. Education was so important that many African American mothers left their children with their teachers for the whole week while they worked, so that their children can get a good education. That in itself is remarkable! 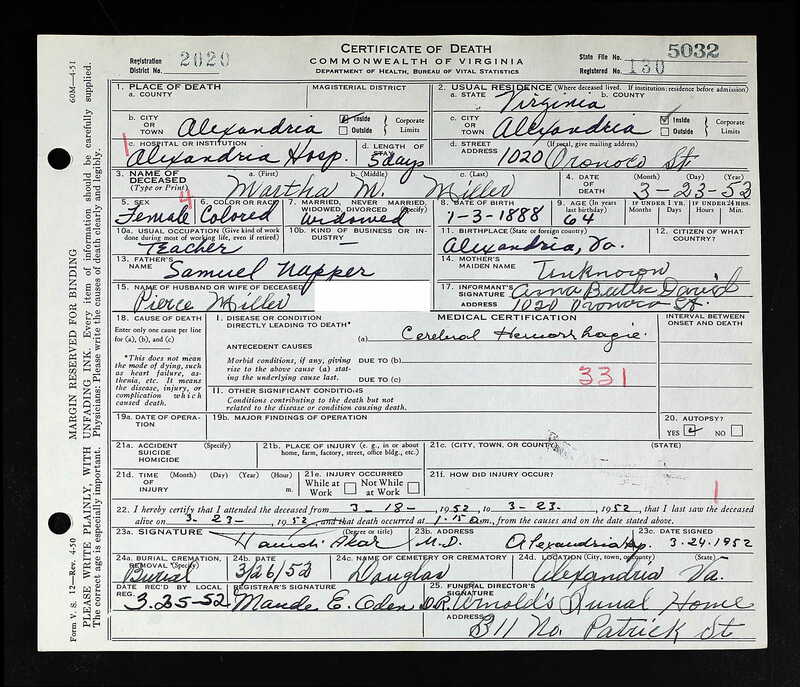 This entry was posted in Black People of Alexandria, Education and tagged 1020 Oronoco Street, Alexandria VA, Alma Pinn-Murray, Anna Woodlawn David, Christine Butler, Cora Napper, Ethel Nelson, Martha Napper-Miller, Mary Howard-Penn, Samuel Napper. Bookmark the permalink.